Gold Goes Big AND Goes Home! Treasuries join gold in the safety trade… second thoughts about a stock market bubble… a happy crypto investor… and more! Finally… Gold has put $1,300 in the rearview. Ever since Election Day last year, $1,300 has been the Midas metal’s ceiling. This morning the bid is up to $1,318. To hear some people tell it, gold is also benefiting from Hurricane Harvey. The thinking is that the storm’s damage will put a dent in third-quarter GDP, making it more likely the Federal Reserve will ease up on its “tightening” policy. To be sure, that expectation is driving down the dollar again; relative to other major currencies the greenback is now its weakest since early 2015. Usually a weak dollar translates to stronger gold… and that’s surely the case so far this week. What’s good for gold is better for gold stocks: As a group, they jumped nearly 4% yesterday and as we write this morning they’re up another three-quarters of a percent. 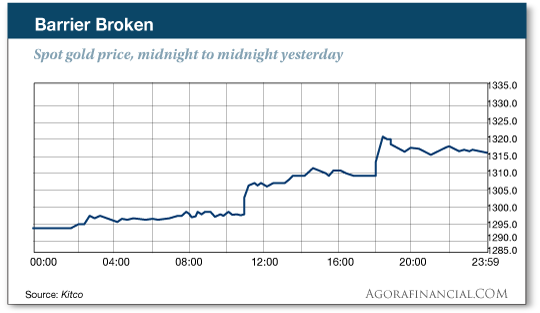 Even before gold powered past $1,300 late yesterday morning, Alan Knuckman — our trading expert at the Chicago Board Options Exchange — suspected something was afoot. Last Friday, his patent-pending trading tool flagged a spike in activity with Newmont Mining (NEM) options. This is the “someone knows something” indicator Alan uses to recommend short-term option plays that unfold in the space of 10 trading days. At 10:03 a.m. EDT, Alan recommended NEM call options expiring a week from Friday — Sept. 8. Less than 90 minutes later, at 11:27 a.m., his readers got another alert, urging them to sell half the position for a 63% gain. Don’t feel bad if you missed out. Alan’s patent-pending tool spots opportunities like this every week. Follow this link to earn more about the power of this tool and how to harness it in your own portfolio. Those North Korea jitters sent Dow futures down more than 100 points before the open. But at last check the loss is only 40 points — not even a quarter of a percent. Treasuries are enjoying a safety-trade glow along with gold. As prices rise, yields fall… and the yield on a 10-year note is down to 2.11% — a level last seen shortly after Election Day. The one economic number of note today is the Case-Shiller home price index for June. It rang in lower than expected, up only 0.1% for the month. The year-over-year growth rate is 5.7%, which has slowed a touch from earlier in 2017. Germany has brought its gold home from New York and Paris — three years ahead of schedule. Here at The 5 we’ve been on this story since the German government announced its plans in January 2013. The backdrop: Germany possesses the world’s second-largest gold stash, after America’s — 3,378 metric tons of it. But about 45% was held at the Federal Reserve Bank of New York. That’s a legacy of Cold War days; in the event Soviet troops and tanks ever swarmed through the Fulda Gap, at least they wouldn’t get their grubby mitts on West Germany’s gold. When Berlin declared it wanted to bring the gold home, the New York Fed said, in essence, “Sure, you can have it back. We’ll have it all shipped to you by 2020.” As many observers pointed out, we’re talking about an amount of gold that could fit aboard two large cargo jets. The seven-year interval aroused suspicion that the gold wasn’t there. But now Germany’s central bank, the Bundesbank, says the transfer process is already over. What gives? The whole thing never made sense, says Jim Rickards: “The German central bank does not actually want the gold back because there is no well-developed gold-leasing market in Frankfurt and no experience leasing gold under German law. But in the context of domestic German politics, the repatriation effort makes total sense, Jim explains. “The driving force both in 2013 (date of announcement) and 2017 (date of completion) is that both years are election years in Germany. Angela Merkel’s position as chancellor of Germany is up for a vote on Sept. 24. She may need a coalition to stay in power, and there’s a small nationalist party in Germany that agitates for gold repatriation. Heh… if only the faction that wants an audit of the gold in Fort Knox had that kind of political leverage in our country! Hurricane Harvey is making a beeline for the federal budget — exactly one month before the debt-ceiling deadline. The U.S. Treasury might well run out of cash on Sept. 29 — which happens to be the last business day of fiscal 2017… and a 2018 budget is not yet in place. So Ray Blanco — our pot stock expert — describes the new Netflix series Disjointed. 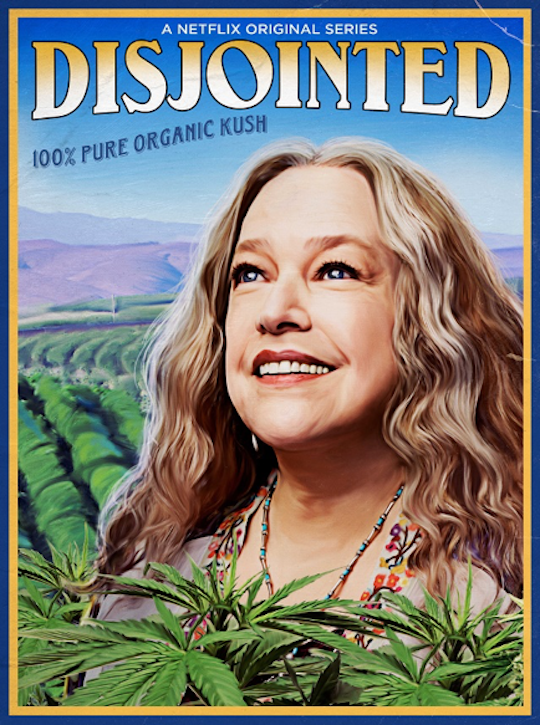 The show features Kathy Bates (Misery, Fried Green Tomatoes) as the scatterbrained owner of a pot dispensary in California. Early reviews have been less than stellar… but that’s not why we bring it to your attention. After all, this isn’t the first show about a middle-class woman’s misadventures in the world of pot dealing. But when Showtime debuted Weeds in 2005, the Mary-Louise Parker character fell into a criminal underworld; a mere 12 years later, that plotline wouldn’t be credible. “That’s a pretty stark contrast,” says Ray. “Television reflects our social norms. And it also influences them. When marijuana is seen as mundane at the same time legal pot states are announcing tax revenue windfalls from recreational weed, it becomes pretty hard for politicians to keep justifying an anti-weed stance. “Normalization of pot,” Ray says, “is what’s going to gently push fence-sitting voters to vote in favor of beefing up their budgets with marijuana tax dollars.” And with eight more states expected to pass pot-friendly legislation in 2018, it will be more difficult for politicians to ignore voters keen on those tax dollars. You might wish to consider investing accordingly. “Are we really in a stock bubble?” a reader muses. “I haven’t seen you or anyone else answer the following questions, although perhaps I am not widely enough read. Most of my life, interest rates have varied between 6% and 8%. A stock’s price-earnings ratio of 15 means you get your money back in 15 years, which I interpret to be a return of about 6.7%. A P/E of 30 means you get your money back in 30 years, which I interpret to be a return of about 3.3%. “Has anybody noticed that interest rates now are closer to between 1% and 3%? Has anybody figured out that if interest rates increased, the government would go broke, so no matter how much they talk about interest rate increases, they are not going to increase much? “So has anybody noticed that maybe a P/E of 30, or even higher, is not so unreasonable these days, compared with what kind of a return someone can get elsewhere in today’s world? “In response to the one–week bitcoin investor veteran,” a reader writes, “in 2014, I liked the idea of bitcoins. I invested a couple of thousand dollars at $20.00. I’ll let you do the calculation. “Since, and long before you hyped the cryptocurrency rage, I have diversified into ethereum, litecoin, ripple, NEM, dash, bitcoin cash, monero, IOTA, zcash, zcoin and neo. Currently looking at diversifying even more… just in case. “I do believe that blockchain is the future of quick, economic and safe transactions between banks (ripple) and anonymous transactions (monero, zcash and zcoin) and smart contracts (ethereum and others). I have done my research on these subjects. “So far, I have been very happy with my cryptocurrency investments. “P.S. As per Jim Rickards’ recommendations, I also own solid gold and silver, precious metals stocks as well as original art. Looking to buy farmland but no luck so far. P.S. Last week, readers of Rickards and Massengill’s Defense Technology Alert collected gains of 27% and 147% after a holding time of eight months. It was Jim Rickards who warned us in this space of a late-August missile gambit by North Korea… so there are more defense-sector gains to be had, as Jim explains right here.